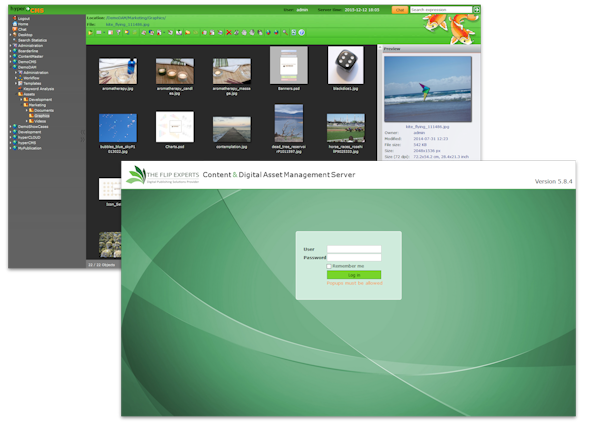 The hyper Content & Digital Asset Management offers an intuitive and very user-friendly interface, which allows managing even the most complex informational structures with ease, also on any mobile device. The user can navigate through pages and edit them at the same time. By a few clicks you can publish your content on various channels, or create a ready-to-print document. 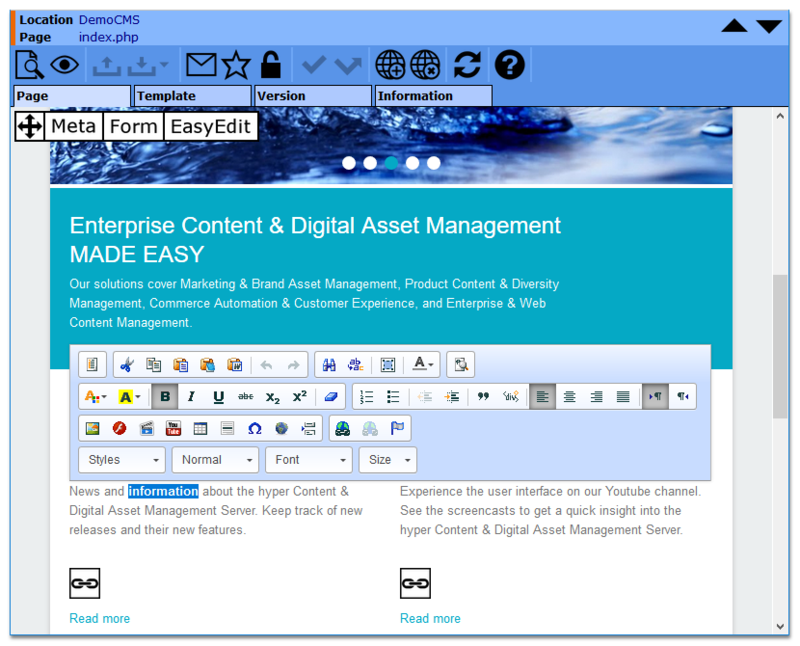 The what-you-see-is-what-you-get interface and inline editing of your content allows you to edit and publish your websites or printable documents with ease. Navigate from page to page and edit the content wherever you want to. The content will be saved automatically when browsing in inline editing mode. For those who feel more comfortable with forms, the system offers a form view at any time. Copy text and tables from Office documents such as Word or Excel, and paste it directly into your pages. The editor also cleans external content and helps with the correct spelling. The automated translation service instantly translates the text in about 150 supported languages. The manual translation service supports about 500 language pairs. 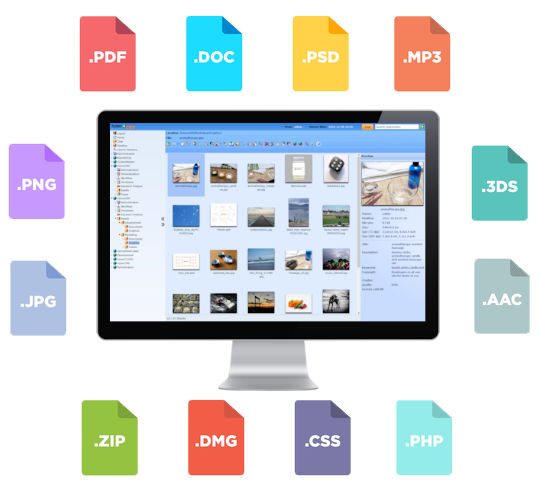 It is easy to upload multiple files from different sources (local file system, FTP, DropBox) to the system, by selecting or drag & drop them. 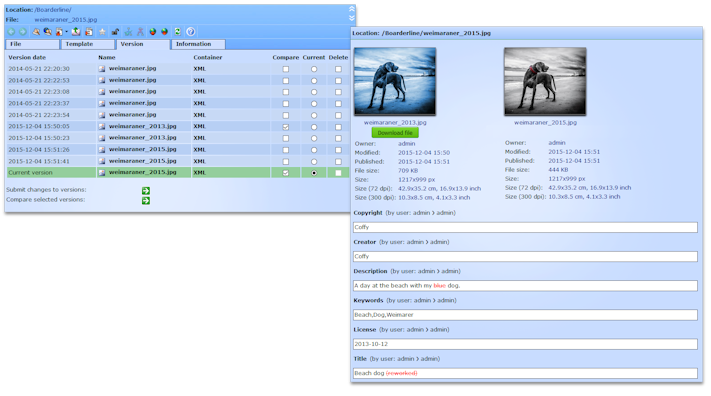 Compressed files that contain folders, data libraries, can be extracted and indexed automatically. Image libraries can be changed in size during the upload. Meta-information will be extracted and transformed to the defined schema. 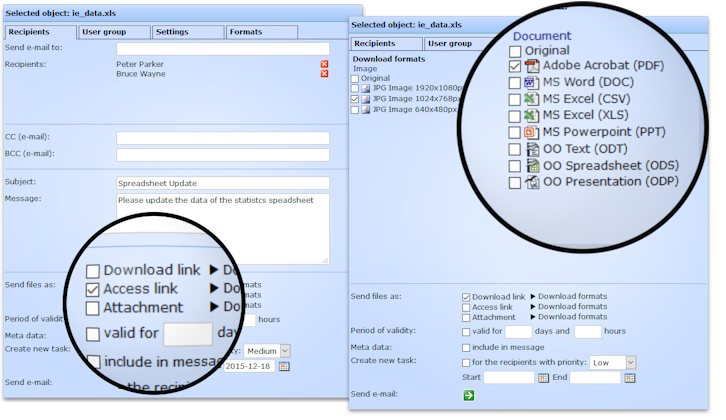 Users are required to enter metadata during the upload of new assets by a simple system setting. 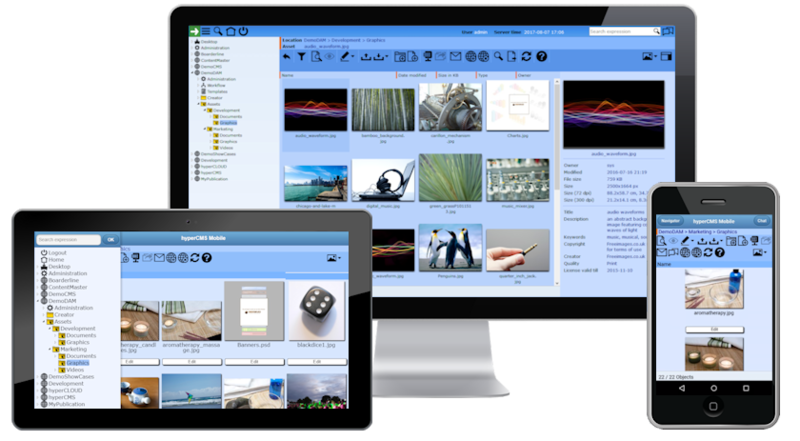 The system works as a central multimedia storage and can integrate its multimedia objects in any application such as catalogue-management, ERP-, shop-systems, etc. It works as a central data hub for all your digital assets and optimizes the management of all your files, avoids redundancy and reduces storage space. The system is capable of reading many different file types and of indexing them automatically. Individual metadata schemas for storing information of files can be defined. 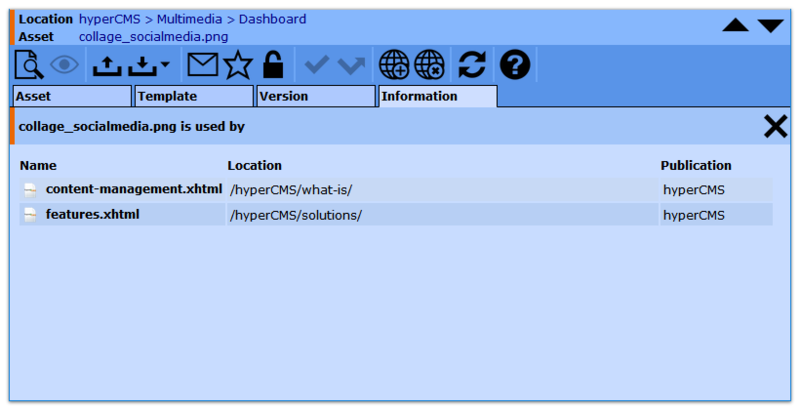 The system can read metadata from files and map them with your own schema. 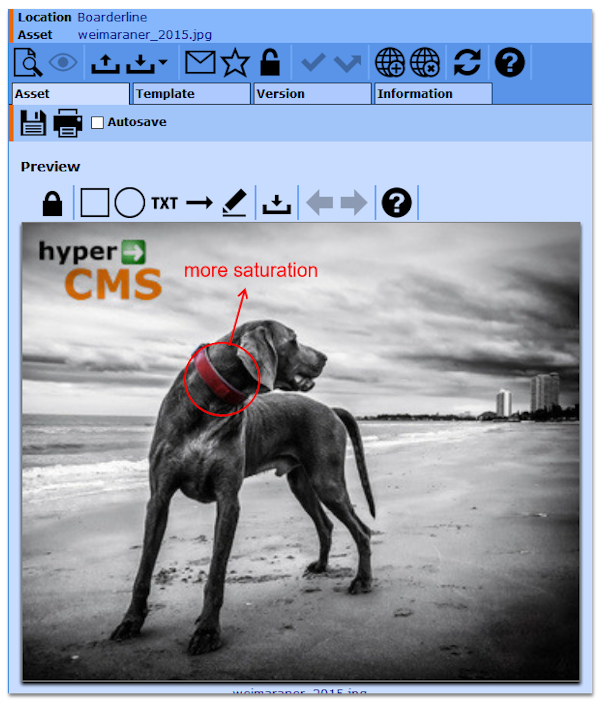 Besides metadata, optical character recognition (OCR) can be used to extract text from images. 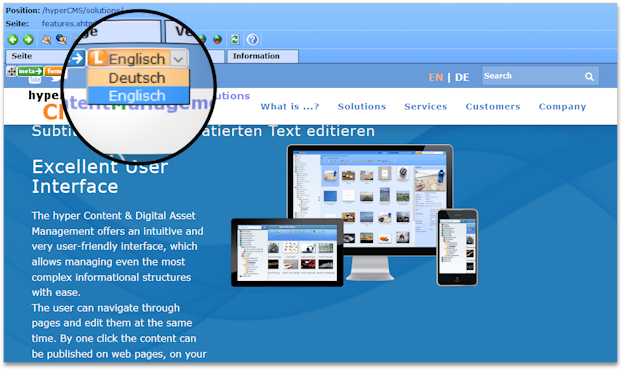 Multilingual taxonomies and synonyms are fully customizable. 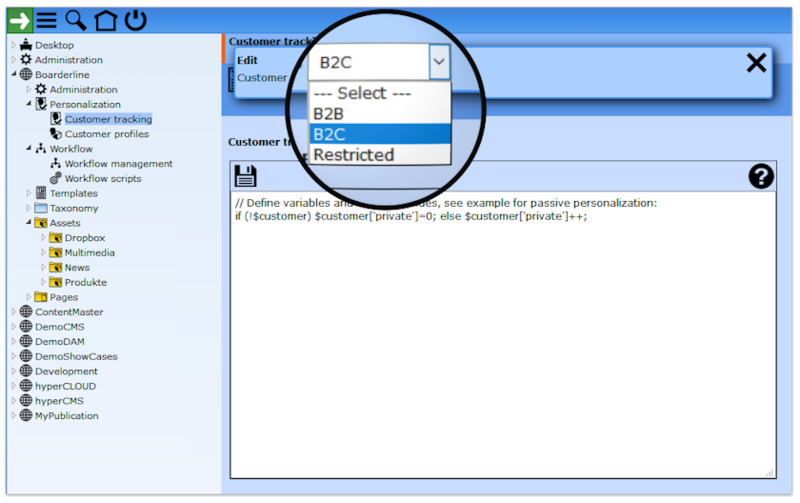 According to their access permissions users can easily find files using the search. 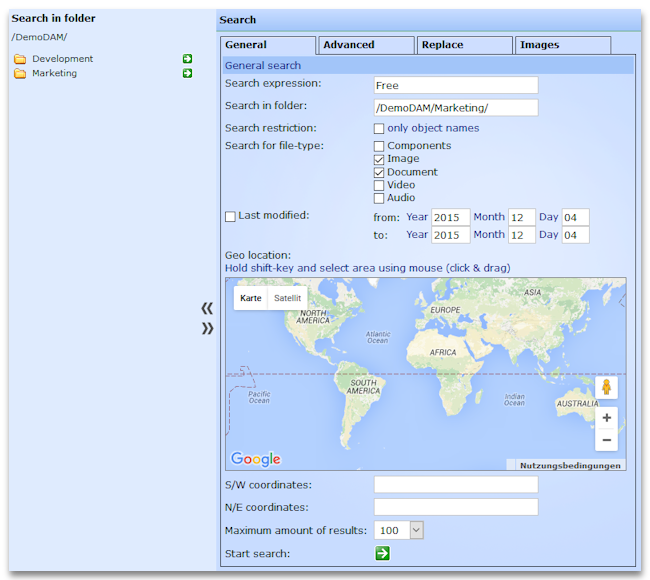 It offers a full-text and detailed search on any content, including an advanced search for images. The system automatically generates previews of files which ease the archiving, administration, and locating of document, image, video and audio assets. Users can view, edit, and publish videos to different channels, like web pages and YouTube by only using their browser and without the need of any additional software. It also supports watermarking and batch processing of videos. 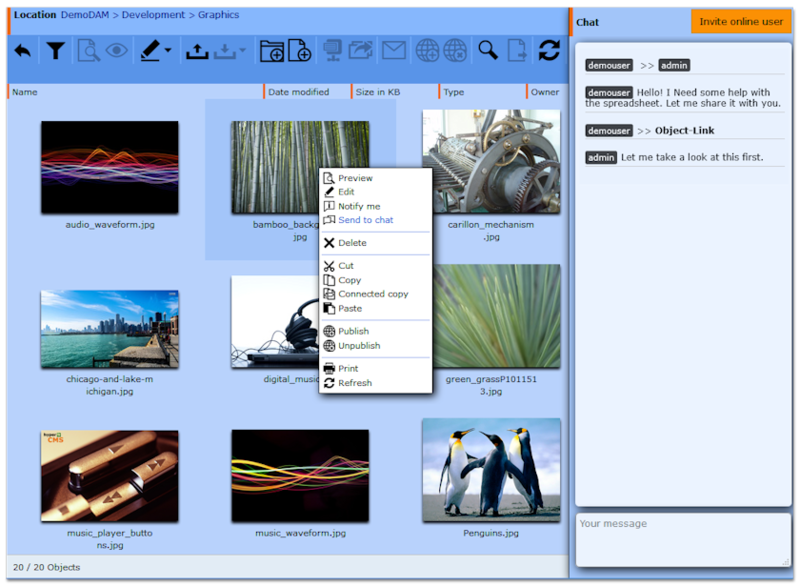 The system supports a wide variation of image formats and enables editing of images in the browser. Images can be processed without additional software and edited for any specific usage. It is possible to convert Adobe Photoshop files to other common formats. These images can then be easily integrated in office documents. A selection of images can be edited at once and watermarks can applied to all images as well. The processing of files or content of any kind will be monitored by the version control. This allows the user not only to compare versions, but also retrieve old versions or restore them again. At the same time, it is ensured that only the latest version is available for retrieval. The recipient of links to assets always downloads the latest version of the file, no matter how old the email message is. With the help of the face detection, persons or objects can be captured on pictures or videos and can be found quickly through the search. The Auto Tagging service analyzes image and video data to automatically identify and suggest keywords, a process that would take time and resources if performed manually. The Auto Tagging is based on Google's technology and includes state-of-the-art machine learning approaches. Managed files can be opened, edited, and saved directly using the Workplace Integration. 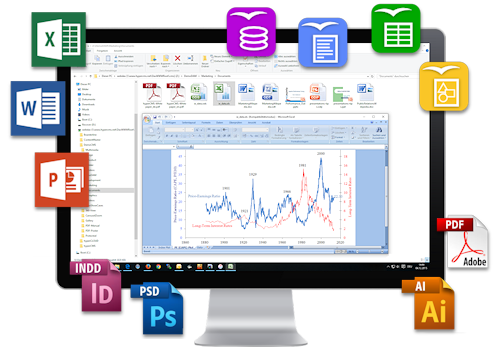 Adobe or Office applications can be integrated seamlessly. Therefore, the download and upload of files is not necessary anymore if you want to use or edit them. To support collaboration in teams, the system provides a fully customized user and group management. Freely definable workflows, task management, and copy & paste from other content sources make your daily work more efficient and improves the level of automation. Keep an eye on selected assets. 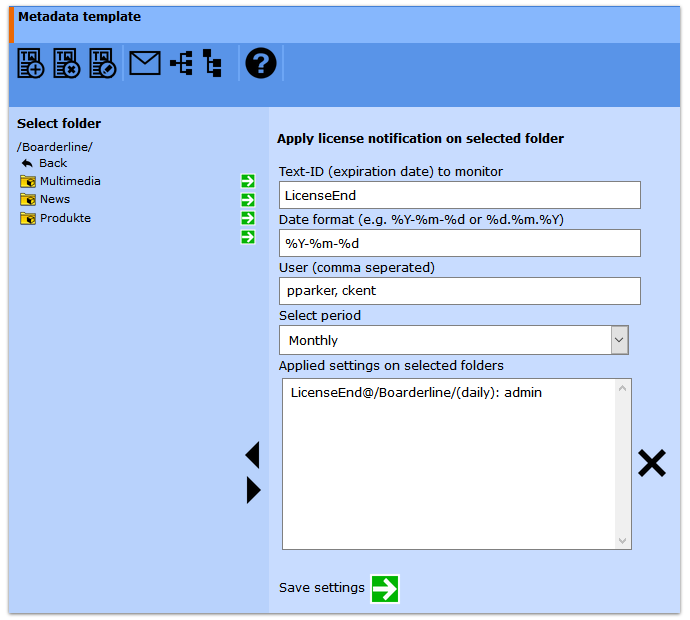 The system will automatically notify you if the selected files or collections of files will be extended, edited, moved or deleted. You will always be up-to-date without the need of being logged in to the system. Annotations can be created directly on images or documents with the aid of tools, so that change requests can be easily and efficiently visible and communicated to other participants. The system will assign tasks to you and will notify you automatically if you are a member of a workflow or changes have been made. You can assign tasks to other users as well. The system will automatically inform you when a task starts or ends. The task management provides insight of the status of all tasks that you are managing or are assigned to you. That way you always have an overview of the work progress and how much time has been invested in your tasks. An extension of the task management is the project management. The project manager can plan projects, subprojects and tasks. The work progress and the time invested in the project or subprojects will be reported in real time. 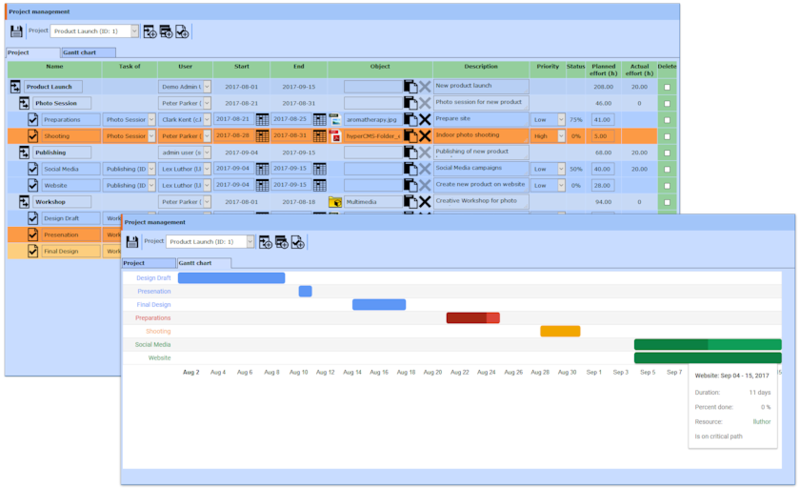 The Gantt chart displays the processes and their work progress also graphically. Define workflow processes and integrate users, user groups and robots therein. 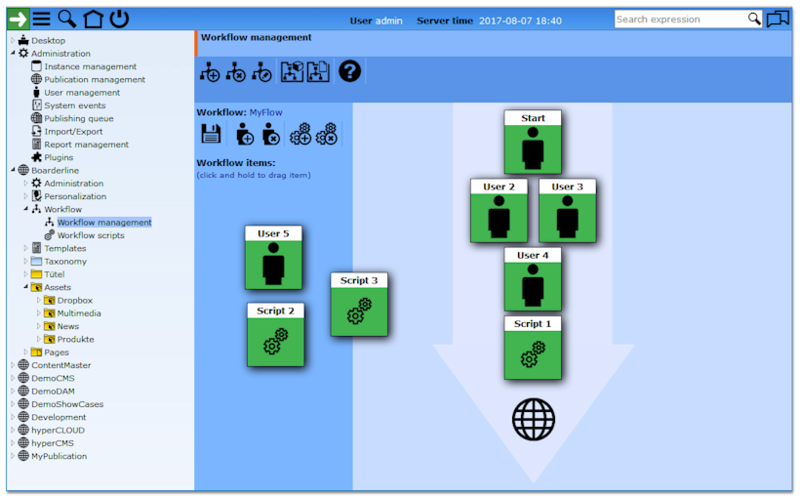 For example, a workflow can be used to define multistage release processes. With the help of robots, you can automate the work even further, since they can perform tasks automatically for you. Use the real-time chat to communicate with your colleagues and work together on projects. The chat is not only for the exchange of information with other team members, you can also simultaneously share your objects while you are chatting with the other participants. This will reduce waiting times and make your cooperation even more effective. It’s easy to share your digital assets with other users or stakeholders. Send large collections of files to people and partners without spaming their e-mail accounts. 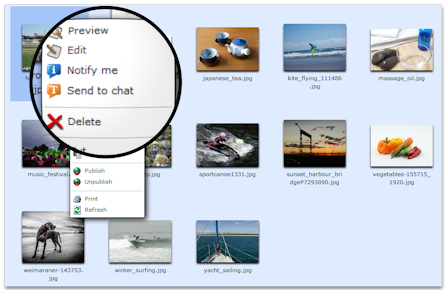 Escape the limitations of FTP, shared drives, sending e-mail attachments and rogue sharing services. Use the build-in mail service or just copy and paste the assets from the system into your e-mail client. Send access or download links straight from the system, so users or non-users can easily access specific files in the formats you assigned. Know who and when your files have been downloaded. Set a link expiration to control how long an asset can be downloaded, this is great for seasonal or rights-managed assets. Keep the lines of communication open and streamlined. With commenting features, you can track communication about creative projects and keep everyone in the loop. 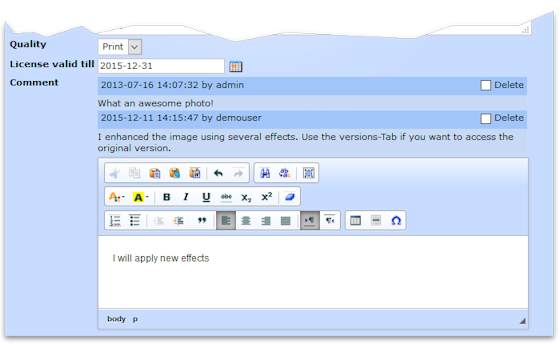 Add comments to your digital assets or collections in folders and get real-time alerts when new comments are added. Don’t be forced to redesign, duplicate or repurchase a stock photo or asset ever again, burdened by the inability to find the original files used in another design. With related assets, you can immediately see all assets that are connected or used in another asset. Regardless of their folder location, users can quickly identify and relate assets to each other for better organization and productivity. 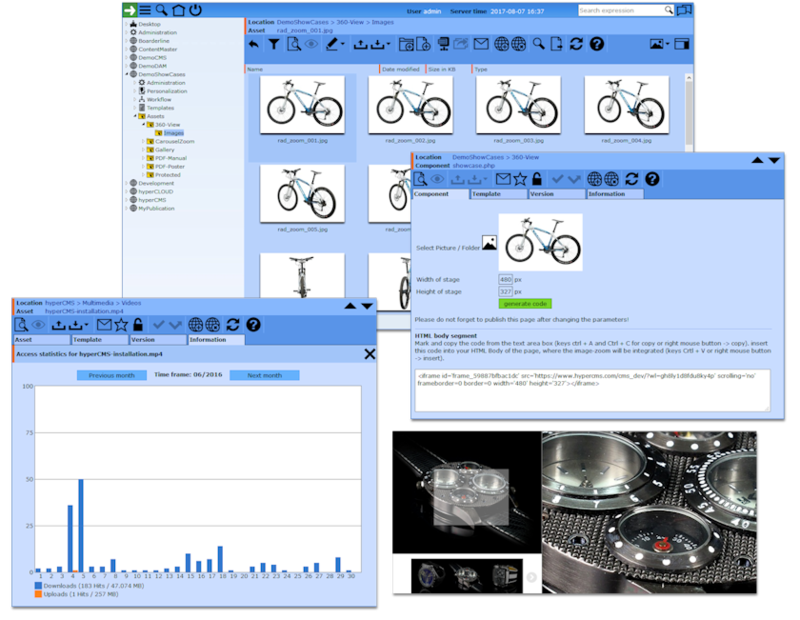 All users have a personalized dashboard as their home screen with useful information, like their recent tasks, favorites, edited objects, up- and downloads. Upon login, you will immediately know what the latest assets are so you can work fast without locating the objects again. See the monthly up- and download statistics in your publication, so you know what is going on each day of the month. See vital analytics about the usage of your digital assets. 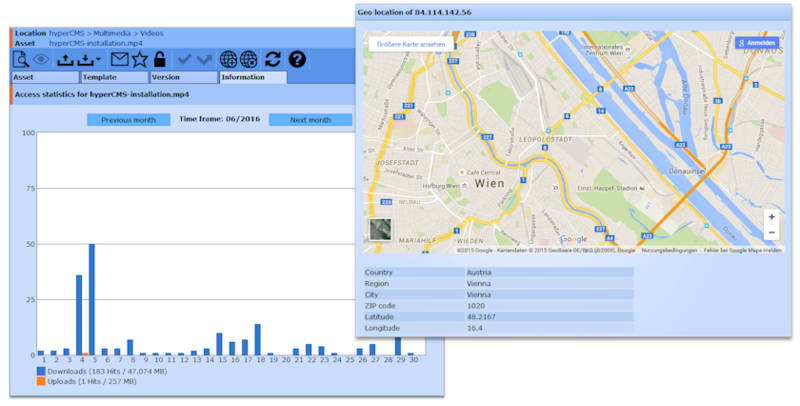 View reports about up- and downloads by time and user including their geo location in case the files got accessed from a public user. The reports are available for any asset or collections of assets. Just select a folder to see what an overview report of all assets. Track who, what and when with respect to your digital assets. After you send e-mails providing links to assets to other persons, you will always know if and when your assets have been downloaded. In addition to the metadata defined and used in your organization, there are often a number of additional metadata that have been stored in a file. This additional information can be viewed at any time using the system. Create individual reports and charts from all available data. 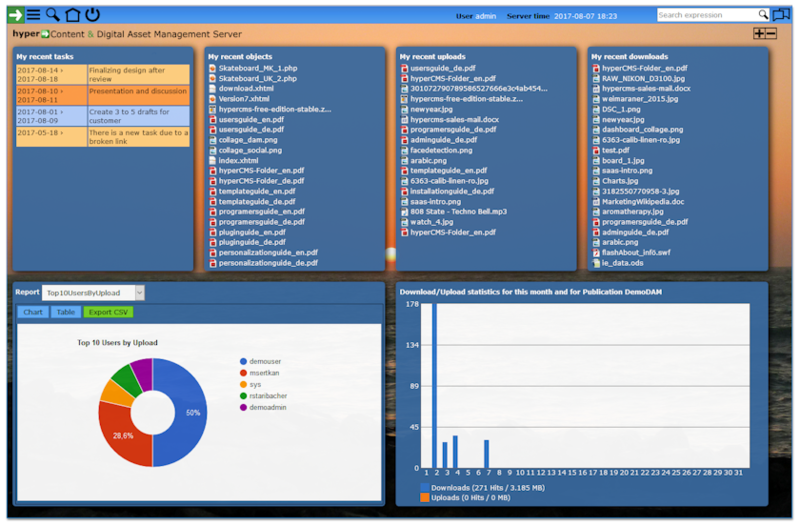 The Report Management helps you to select the data for your report and creates pie, column, timeline or geo charts automatically. This way you can show where your assets have been uploaded on a map, present the tasks of users in a timeline chart, or define a usage report as a column chart. Publish your content to multiple channels in different presentations. Repurpose content easily, multiple times and maximize the return on your assets. 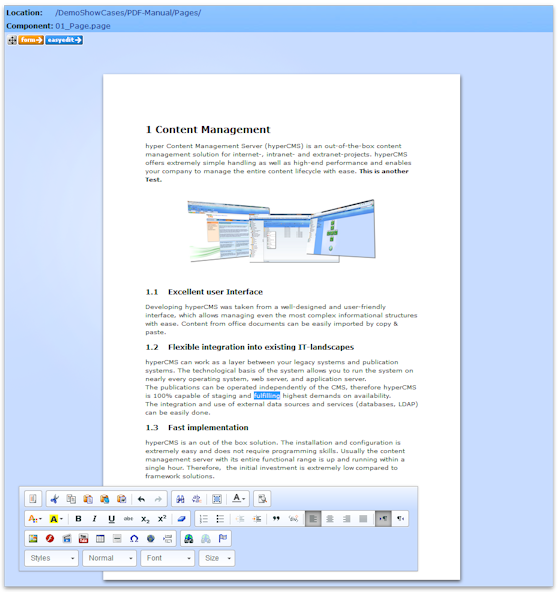 Publish to print, mobile, tablets, social, and web from one system. Take advantage of the scheduled publishing and unpublishing. 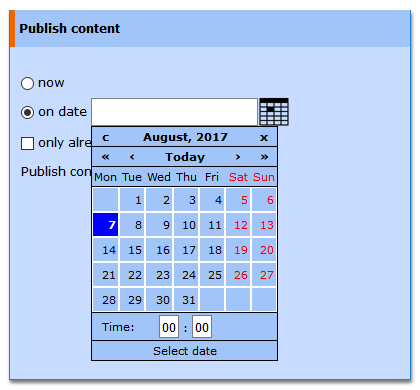 Simply set a date and time when your content should be delivered. Save valuable time for your social media marketing teams. The system is integrated with most popular social media networks to support your social media management efforts. 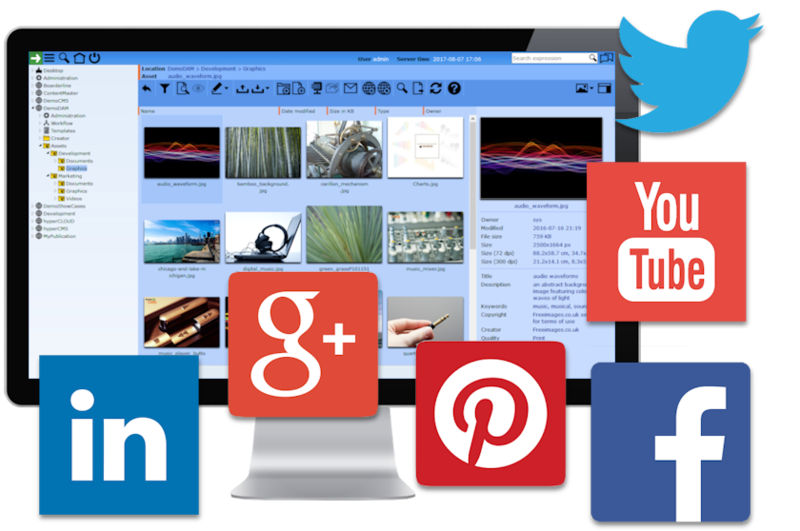 Quickly share assets across Twitter, Facebook, YouTube, LinkedIn, Pinterest, and other social channels. Use a simple code snippet generated by the system to integrate your assets in external platforms or your own websites. Easily integrate your videos in websites, and product presentation with zoom and product rotation in online shops for a better customer experience. Measure the success of your assets, wherever they are being used, by the integrated reports of the system. Personalization is commonly used to enhance customer service, sometimes it is also referred to as one-to-one marketing, because the enterprise's Web page is tailored to specifically target each individual consumer. Use customer tracking and customer profiles to analyze your visitors and provide rule-based personalized content. Create ready-to-print PDF files or other file formats without special software and knowledge. Your partners or subsidiaries can use inline editing or form based editing to change specific content to their local requirements and send them to the print shop. Our awarded Web2Print innovation can save you up to 70% compared to other commercial solutions. Manage your brand efficiently around the world. 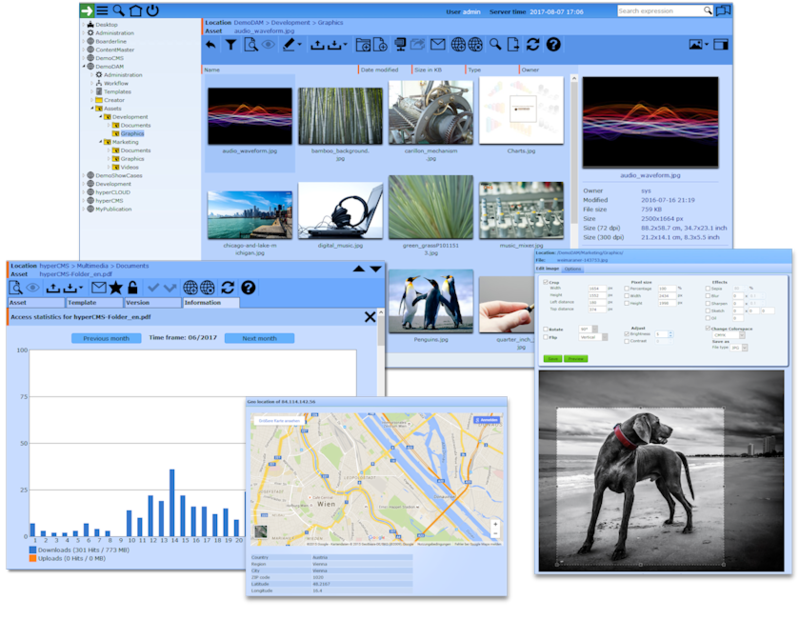 Ensure teams always have access to the latest versions of your brand assets. Control who uses what and monitor access. Make sure all your partners and agents are using your templates to produce their product folders and magazines. The system can track information of assets, such as the date of the expiration of a license, and it can lock these files automatically. This feature allows you to make sure that nobody uses rights-managed images beyond their license. Build and manage Brand Portals without any technical limitations. A Brand Portal gives internal and external users quick access to branding rules and content, like logos, images, fonts, audio, video and other branding materials. The Brand Portal drives brand consistency and leads to improved customer loyalty. Easily brand your system in your corporate design. The Enterprise Edition of the system includes the Client Brand Module that will provide you with your individual design theme. The branded interface of your system will provide your internal and external users the look and feel of your brand.